January 11, 2016 By Allyson 1 Comment This post may contain affiliate links. Read my disclosure policy. 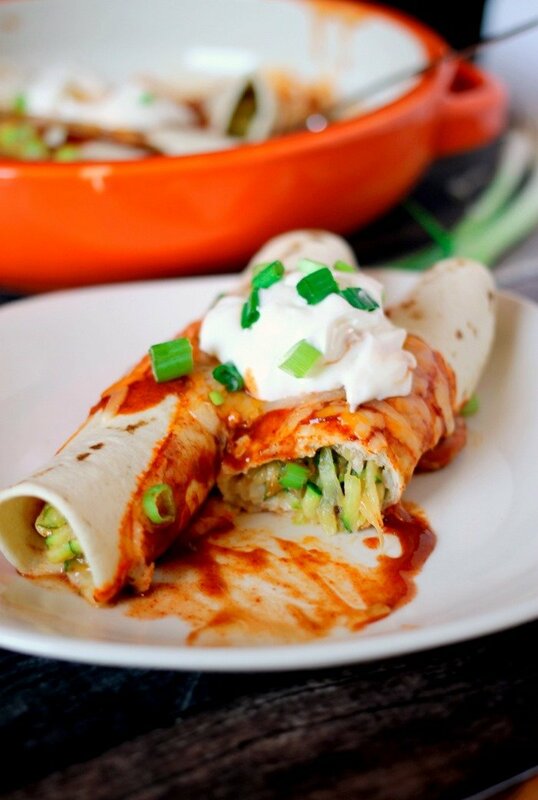 Black Bean Zucchini Enchiladas are filled with healthy ingredients and comes together in 30 minutes! Now that it’s the new year, everyone is trying to eat healthier and start out on the right foot. 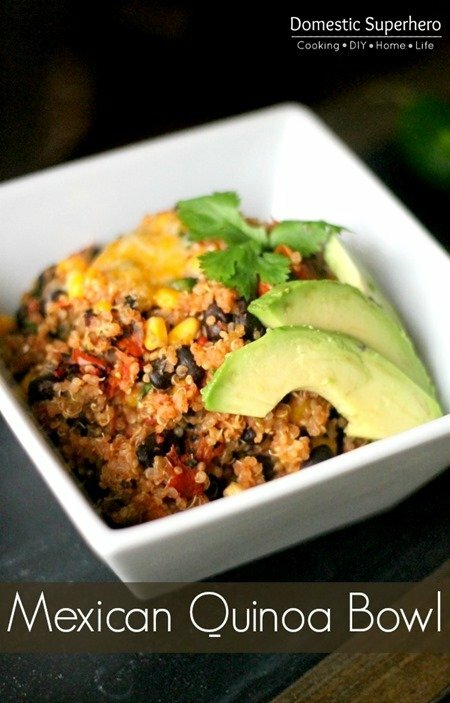 I love coming up with new healthy recipes, and this one is super delicious. 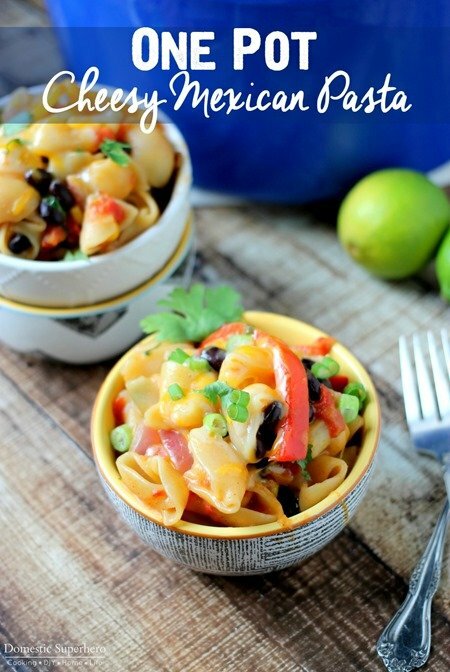 It is vegetarian, so it’s perfect for meatless Monday, vegetarians, or if you just want to leave the meat out one night. Leaving the meat out not only saves calories, but it also saves money and the time you would spend preparing it. 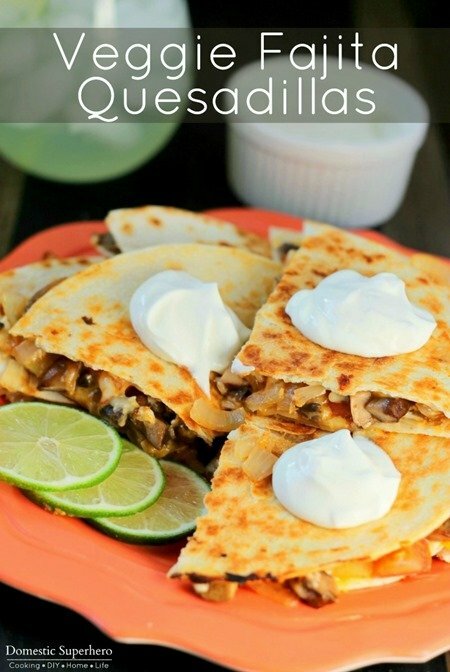 Vegetarian Black Bean Zucchini Enchiladas are the perfect healthy easy dinner! 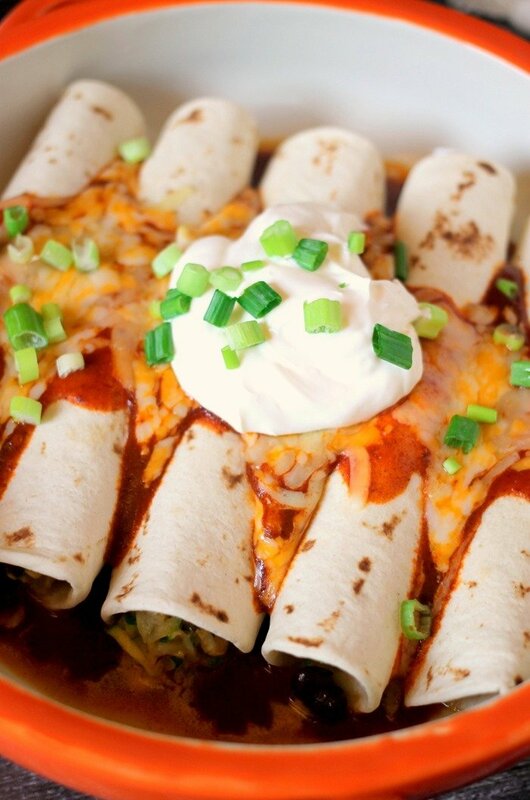 Make sure when you are making these Black Bean Zucchini Enchiladas, that you let the zucchini dry out. You want to squeeze the water out to make sure it’s as dry as possible. If you don’t, you might have some soggy enchiladas on your hands. I actually like ringing the zucchini out in a clean microfiber towel – these things soak up everything! I also recommend using your food processor to grate the zucchini; it makes like so much easier! 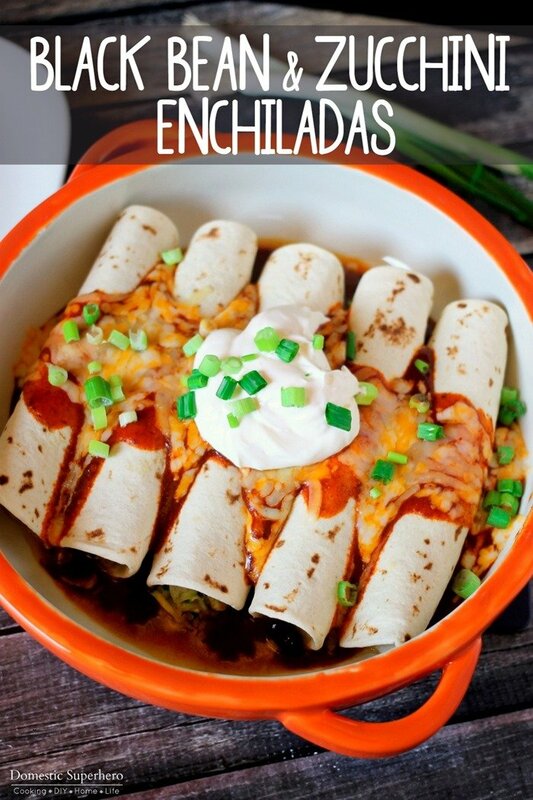 I also recommend making your own enchilada sauce. 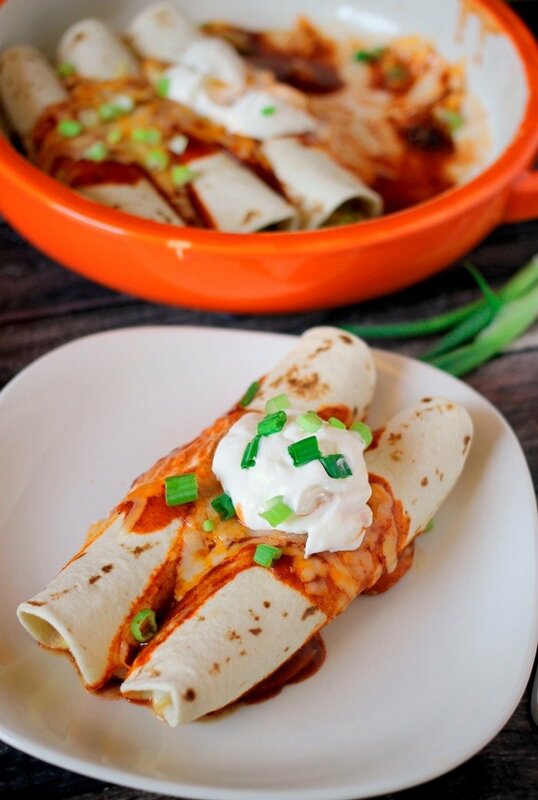 I LOVE my Easy Chipotle Enchilada Sauce for this recipe, but hey, if you don’t have the extra few minutes, just use canned – no big deal. I typically whip up a big tray of these Black Bean Zucchini Enchiladas, and eat them throughout the week. 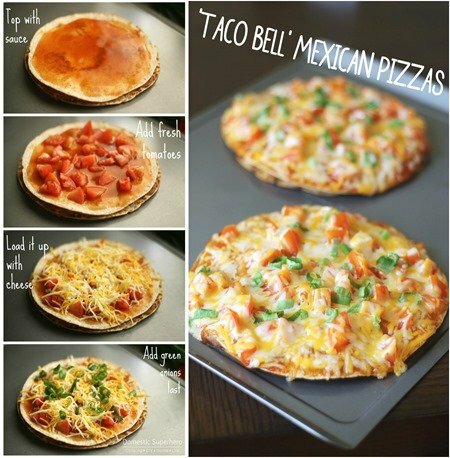 I am not sure how they would freeze, but I think it would be worth a try, if you wanted to experiment with that! 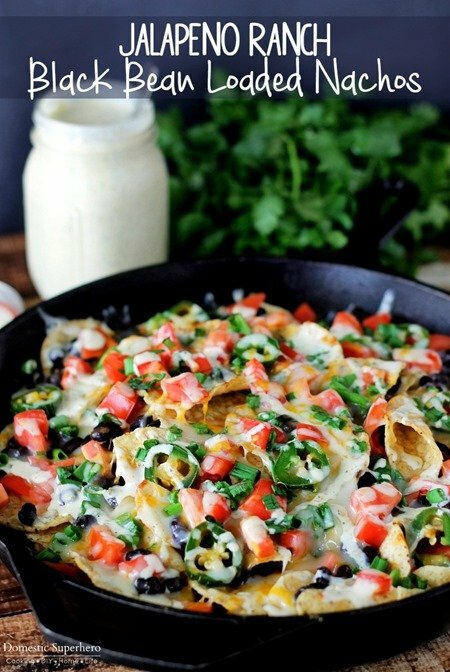 Another tip to keep your Mexican food on the healthier side, use Greek yogurt in place of sour cream – it’s an awesome replacement and adds lots of extra protein. Preheat oven to 400 degrees F. Spray large baking dish with non stick spray, then add 1/4 cup of enchilada sauce to the bottom, spreading out on the bottom; set aside. In a large skillet, add olive oil and garlic, saute for 30 seconds over medium heat. Add zucchini, cumin, chili powder, and 2 green onions; cook for 3-4 minutes, stirring occasionally. Add cilantro and black beans, cook for 2 more minutes. Add 1/2 cup of the grated cheese (saving rest), and stir to combine. Remove from heat and set aside. Add about 1/4 cup of the mixture to the center of each tortilla, then wrap closed. Place tortilla in the baking dish, seam side down. 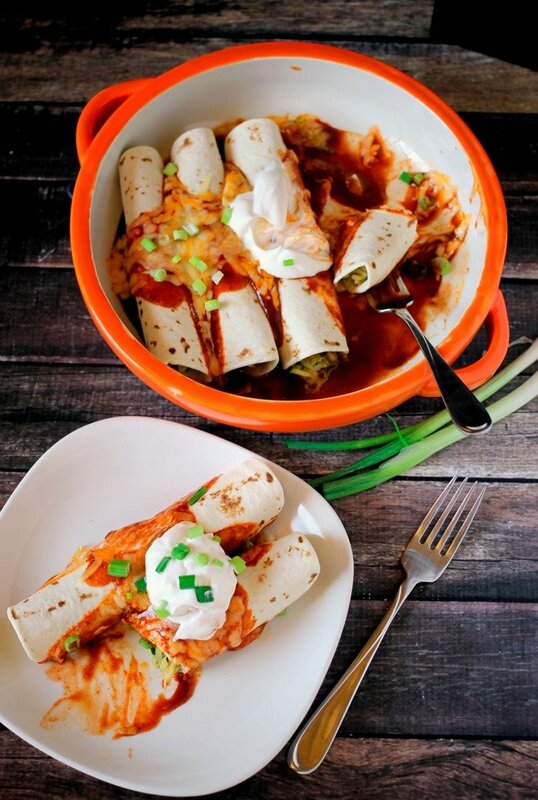 Repeat until all enchiladas are made. Pour the remaining enchilada sauce on top of the enchiladas. Sprinkle remaining cheese over the center. 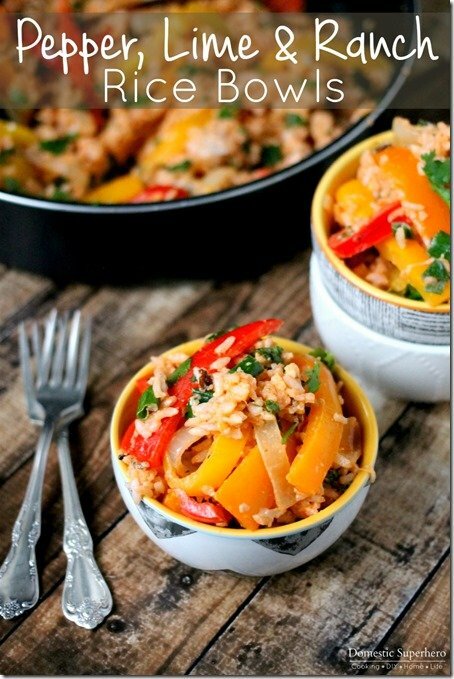 Place in oven and cook for 15-20 minutes or until cheese is melted. 6. Remove from oven, top with chopped scallions and greek yogurt if desired. Serve immediately.